if you can tune the oscillators slightly off from each other and maintain that difference, might be kinda cool. but i actually don't mind tuning oscillators! This is actually a very impressive module. As always, with Bastl, it's not your standard MIDI-to-CV. This baby can play by itself while your busy tweaking away, and then BAM you hit your next chord and everything evolves into something super musical! I also like how you can clock it so your notes are synced (re: you can force your notes to be on time, if you want). It's the name of the module ? Also the year Midi was implemented? Huh, I'm actually excited for a MIDI module. If this can do Hz/V like the company literature seems to suggest, I may finally kick my A190-4 to the curb. Call me crazy, but I like when all my modules from one manufacturer look similarly. It's a minor gripe of course, but Bastl just got their panel game under control. I didn't mean to knock the module, I just don't like fonts I can't easily read and discontinuity in a set. I think this looks really superb. Quite apart from the automatic tuning behaviour, I think there is a gap for a MIDI-CV module at this size..... I have qmi2, which is very functional but huge. And even Yarns is 12HP. I don't like the panel design/fonts and that but hey, I wouldn't let it stop me here! 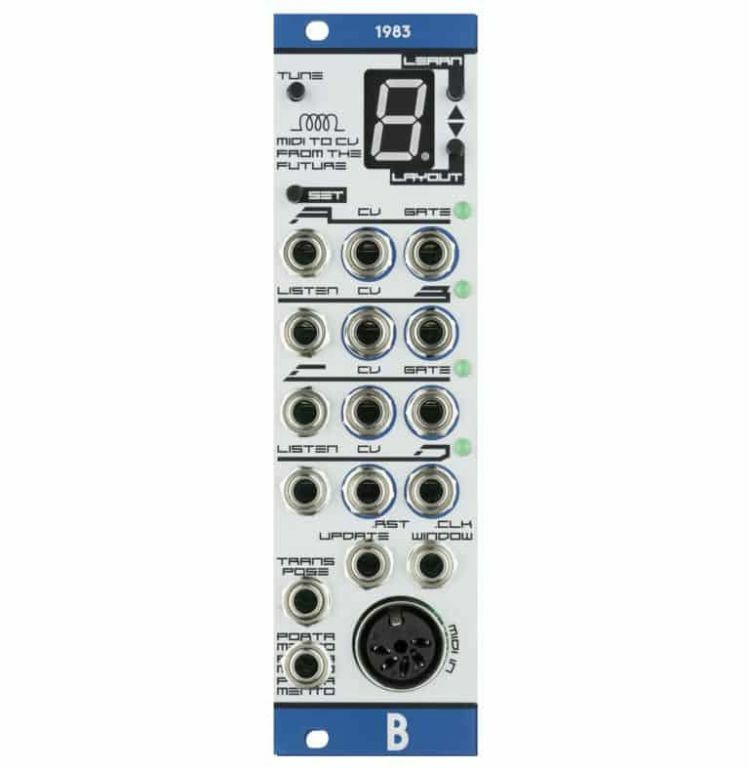 Interesting module, I hope that module can be expandable, extra panel for velocity and one cc for each channel at lest . I don't like that font either! heres to hoping a <~200 price tag. font is terrible and good simultaneously. bastle kills its with the graphic design. gotta say i was sceptical about that blue/silver aesthetic but ever since i got my tromso i think it looks seriously clean in person. they got an eye for good design and ive come to really dig the aesthetic. I've said it before; I liked the wooden panels. I thought the wooden panels were cool. But this is pretty cool too. I also like the font. And Bastl's perchant for odd-hp modules doesn't bother me. are they stopping using wooden planels?? Agreed... not even really in need of a MIDI-CV module at this point but this thing looks like it could be a nice timesaver. Where did you see that it can do Hz/V? I looked and all I saw was choosing between A = 440 hz or 432 Hz which is totally different than Hz/V. Where did you see that it can do Hz/V? The fact that it has a Listen function which maps response across seven octaves suggests it. The listen/tune to a custom voltage table is a really great idea. Imagine how it might tune an FMed sound source, or something distorted/waveshaped! I wonder how long the whole calibration process takes, and if it does all 4 channels at a time. Does it let you save and recall tables? The values might not hold perfectly if you have an oscillator that takes a bit to warm up and stabilize I suppose. Definitely sounds like a cool function that I didn't even realize I really wanted until hearing about it, but $300 is way on the high side with the feature list as it stands now. Hopefully the 'listening' jacks can be used for something else besides just tuning. Otherwise they'd just stay there unused until you need to tune again..
im in the market for a midi-to-cv-module that can auto-tune up the osc's but i not sure what is the difference between the 1983 and the clavis cal-trans. both would be a bit overkill for may hp-space, but one of them i could wiggle in.. what do you think about the two? Well, this like it might have to replace my Yarns. I think they make very interesting modules, very excited about this one! Just noticed the ETA is now december 2018..
Decembre? It's the only module i need/want! Hey bastle we are in December.